"It's just fabulous!!! Informative, accurate (a nice change from lots of stuff written about menopause), funny and just so accessible. I love it and finally have the definitive book to recommend to my patients." Funny and informative but also thought provoking. This book has caused me to re-examine the way I am responding to the menopause. I would recommend it to friends. In fact the book has very high quality information and is also full of different experiences with really funny parts - very well interspersed. 4.0 out of 5 starsA Fun Read on a Tricky topic . This book is a must read for every member of every family that has a Mother,Sister,Daughter, Aunt, Grandmother. 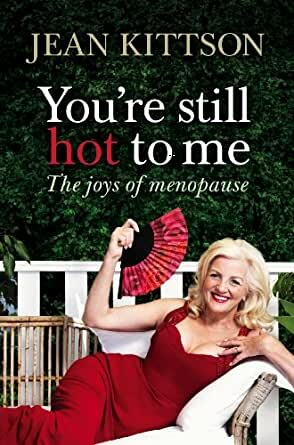 In this easy to read,enjoyable book,Jean talks about all the aspects of Menopause that are usually hushed up. I'm sure if this was made compulsory reading there would be much more harmony in everyone's world. Jean Kittson could almost be a walking talking advertisement for HRT. That said, there were moments when this book made me laugh out loud and that's a good thing. Great book, very helpful. It was informative, told with humor. Made we laugh, made me cry. Well done Jean Kittson. 5.0 out of 5 starsGet it !! You wont regret it !! Just what I needed at the moment. A fantastic mix of hilarious comedy and very important fact. I related to this so much! Loved the humour in what really is not a humorous time of ones life!